Bond Economics: Canadian Economy Going Nowhere, But Will The Budget Be Balanced? Canadian Economy Going Nowhere, But Will The Budget Be Balanced? The Canadian economy has been performing better than my very low expectations, but that is not saying too much. The labour market is stagnant, and condo developers refuse to give up. The lack of drama is allowing the Federal Government to move towards fulfilling its campaign promises, including the adoption of balanced budget legislation. The Labour Force Survey data were mediocre, but looked better than the previous month. The Employment Rate ticked back up to 61.4%, but it has hardly budged since the depths of the financial crisis (chart above). The unemployment rate was flat at 6.8% in March. If adjusted to United States U-3 concept, it is 5.9%, while it is 5.5% in the United States. Thus, despite the moaning about secular stagnation in the United States, and the earlier economic triumphalism that emanated from Canada, Canada now has higher labour market slack. 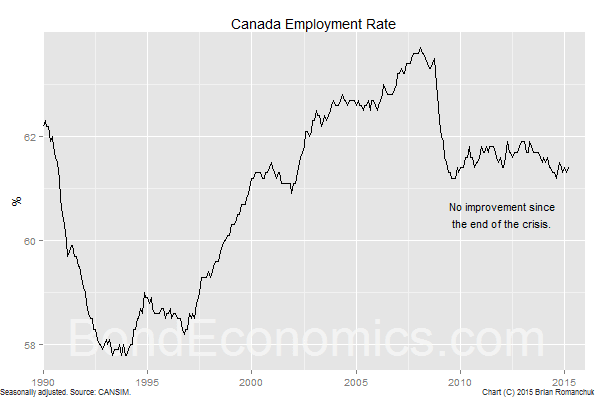 And this is before Canada has dealt with the overhang of condo construction, and the ripple effects of the collapse in energy prices probably has not yet hit the hard employment data. Multiple unit starts (mainly condos) jumped in March, recovering from the exaggerated dip in February (more terrible weather than usual). 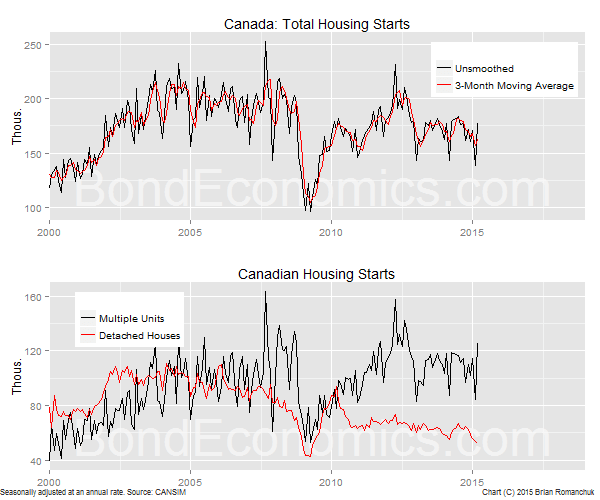 Nonetheless, detached housing starts continued to dive, as severe over-pricing an a stagnant job market take their toll on the ability of Canadians to trade up to detached houses. The issue that hangs over the market is whether the pipeline of completed condos can be continue to be absorbed. Finance Minister Joe Oliver's latest muses about introducing balanced budget legislation is the worst policy for Canada, and will doom us to European-style crises and rob future generations of prosperity. That said, I do not believe the Federal Government would propose an extremely strict balanced budget rule (like my debt limit simulation); it would have some flexibility (like the "Golden Rule" adopted by Gordon Brown in the United Kingdom). Since there is no proposal on the table, I cannot comment on the specifics. There is a comprehensive document created by the Office of the Parliamentary Budget Officer (PBO - part of Canadian Federal Government) on this topic - "Federal balanced budget legislation: Context, impact and design" (prepared by Scott Cameron, released in September 2014). It outlines the parameters of how balanced budget legislation would likely work, and it contains a history of budget outcomes and the theoretical arguments around balanced budget legislation. My opinion of the report is mixed: the practical discussion is excellent, but the theoretical justification reflects mainstream analysis, and is correspondingly terrible. As I have noted earlier, I am in the process of writing a report - Understanding Government Finance - and it covers some of the ground within the PBO report, but in a sounder fashion. My feeling is that the practical effect of this legislation will be much less spectacular than what we saw in the euro area. What we will see is that the government will work around the legislation, using methods that are outlined in the PBO report.What will happen is that the government will increasingly use opaque, off-budget methods to implement policy. Instead of transparently accounted fiascos involving public servants that gets fiscal conservatives riled, we will have off-budget fiascos involving Crown corporations, lending guarantees and public-private partnerships. renting the houses to Canadians on a long-term rent-to-own basis. This second method of financing would look quite different from the standpoint of government accounting; the government would be running quite large deficits as it causes the housing sector to overheat. Balanced budget legislation would provide an incentive to repeat the "success" of the housing bubble in other areas of the economy. But the federal government does not distinguish between current spending and capital spending: It's all lumped in together. Therefore, forcing balanced budgets will lead to considerable under investment in our infrastructure — it will grossly depress an already-depressed commitment to infrastructure spending in Canada. The budgetary balance in the federal public accounts and budget plan is defined as the net operating balance in the IMF’s Government Finance Statistics Manual 2001. The net operating balance is equal to accrued revenues less accrued expenses, where accrued expenses include interest payments and only the portion of capital investment which is recognized in that year (typically a fraction of the capital asset’s useful life). Federal budget accounting uses an accrual basis, and so only a small part of spending on long-term investment is recognised in a given year. Therefore, investment spending can be ramped up without having too great an impact on the budget balance. * This means that it will be the preferred means of stimulating the economy. This has the side effect of increasing inequality within the labour market, which was a complaint of Hyman Minsky's in the 1960s. [Update] Ramanan has recently posted an appropriate quote from Wynne Godley taken from a Guardian article published in 2005. There is a section which relates to this bias towards infrastructure investment versus current expenditures. Criticism of the fiscal policy regime has focused too much on whether Gordon Brown will break his self-imposed Golden Rule and not enough on whether the rule is acceptable. The Golden Rule states that the balance between receipts and current expenditure should be zero over the cycle, exempting public investment, which does not ‘count’ for the purpose of making this calculation. A relatively minor objection to this arrangement is that there exists no relevant difference between, say, capital expenditure on school building and current expenditure on teachers. Both are equally necessary for education and both absorb resources (pound for pound) to roughly the same extent. Functional Finance rejects completely the traditional doctrines of "sound finance" and the principle of trying to balance the budget over a solar year or any other arbitrary period. Achieving balance across a solar year is a sensible goal if you are a farmer or a Druid, but much less so if you are Minister of Finance. * I do not wish to have a long discussion of how accrual accounting differs from cash accounting. But when the government accrues investment spending, only a small portion of the cash outlay is "expensed" in the form of depreciation. The remainder of the spending will be depreciated over the life time of the infrastructure. In contrast, if the government followed cash accounting, the full investment is "expensed" in the first year. However, since nominal investment spending is expected to rise over time, in line with inflation and economic growth, the amount of depreciation will typically be less than the new capital expenditure. This means that the "expense" associated with investment will be less when using accrual accounting. Please note that I am using expense as it used in corporate accounting; governmental accounting terminology is somewhat different. * "Functional Finance and the Federal Debt", Abba Lerner, Social Research 10: 38-51, 1943. Quote: The budgetary balance in the federal public accounts and budget plan is defined as the net operating balance in the IMF’s Government Finance Statistics Manual 2001. The net operating balance is equal to accrued revenues less accrued expenses, where accrued expenses include interest payments and only the portion of capital investment which is recognized in that year (typically a fraction of the capital asset’s useful life). Sorry, you are mixing the two. First, you are incorrectly saying that the whole of investment expenditure is not counted. Second you got the sign wrong. The PBO doc you refer (which refers to the IMF doc) says that "depreciation" is netted, so the net operating balance is a net of consumption of fixed capital. Yes, capital expenditures are recognized as expenses, eventually, but not within a "given year" (for a particular investment project). Over time, nominal GDP grows, and so the increase in expenditures will be larger than depreciation expenses, even if the percentage of GDP that is government investment is fixed. I did not spell out that growth assumption, which may have been a mistake in editing (I dropped it as I thought it was a distraction). I misread the IMF guide (pp 38-39) as it made it look at some places that net lending is the operating surplus (as it both says expense and purchase of all goods and services at the same time) but I looked more carefully and what you say is right.